As of today, Brisbane has a new mother of a development project, and no we’re not talking about the new integrated casino precinct (yet). 300 George Street would be considered large by any international standards, so for Brisbane this project is simply off the chart. 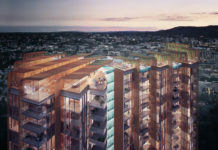 UPDATE – Today the Brisbane City Council has given the green light for this development to proceed. Demolition of the old courthouse is proceeding. The site which formally housed Queensland’s old Supreme Courthouse will soon accomodate three ultra modern glass towers, one rising to a peak of 82 levels or 274m AHD. The developers behind this project are a joint venture between Shayher Group and Bao Jia Development. The scope of the project is undeniably large and detailed, so below is an extract of the vast amounts of information included in the project DA. The hotel is the smallest of the three towers and serves an important role in connecting and integrating the podium into the larger towers. Strategically positioned on the corner of George & Ann Streets addressing the neighbouring business and civic context. This location also allows a distinct commercial address on the prime george street frontage whilst providing for the primary retail podium entry on the corner of George & Adelaide Streets. Drawings also indicate a new busway tunnel portal entry on the Adelaide Street side of the tower. To view this project in greater detail, you can download a copy of the DA through PDOnline. Application number A004079323. Visit http://www.300george.com/ for frequent demolition and construction updates on this project. 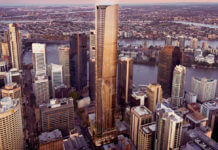 Is it Australian record for most skyscrapers over 250 metres under construction at once? 1 William St (259m), Infinity (262m), 111+222 Mary (274m) and now maybe this 300 George (274m) development as well? This is a WONDERFUL news otherwise! Brisbane certainly does not need an additional 50-odd-thousand sq meters of office space THIS time round. With the other three biggies already well underway, a big blowout in vacancy rates is expected in 2017. Are these developers cashed-up foreigners or what? No self-prolonging local would dare jump in with this office development now…maybe if they start construction late in 2016 this would be feasible? Why does it look like an iPhone??!! I do like it, but would’ve loved to see something that gives Brisbane an icon. Maybe iPhone tower will be the icon?! This space was an idea for an opera house/music venue years ago? I think it even made it’s way over the motorway and overlooked the river? I’d love to see that there to be honest. I love this proposal! The towers are so modern and sleek. Also love the integrated nature of the 3 towers and ground level retail. Well done Shayher! The hotel building definitely looks like an iPhone! It was my first thought too. These designs are much more welcome than the Combine tower vibe that the early concept gave off. Anyone else ntoice the underground bus entry/exit on Adelaide St in the Ground plans? Love the design! Wondering if the Brisbane Airport Corp will give the green light for this development to go ahead? 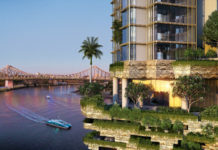 I think this development will be great for Brisbane!! 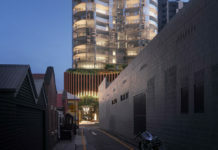 The design is certainly fantastic, although I completely agree with blacknganga – the building we’re currently in on Queen Street is 30 levels and more than half are vacant. Why build more commercial buildings when you can’t even maintain or fill the ones you already have?! Suncorp are still looking to consolidate 5 current sites into one after their Southbank venture fell through. Just maybe there are some talks going on……..for the space in the office tower. Especially as they occupy the top 13 floors of Brisbane Square at the moment. This is great for Brisbane however I’m not a big fan of the iPhone shaped building. This is the third development on this site. I wonder if anything remains of the convict hospital and the first Brisbane hospital after free settlement in 1842????????? Hope archeologists have a chance to look for remains. It’s about time Brisbane started to get some decent architecture that isn’t boring. Yeah, im not a fan of the iphone building as others have said…but …if its going to house a real 5 star hotel chain like the mandarin oriental, then ill certainly be pleased. Brisbane desperately needs a major intl 5 star hotel chain like the mandarin. The other building look good. 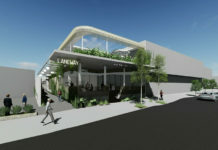 Very dynamic development on a high profile historic site in Brisbane lifetime. Congrats to the team . Anyone know when they will start selling apartments? They seem very shy right now.